After last year's award-winning Borgward P100, André Paul Siefert surprises us with the miniature of a 'Keyhole'-Kapitän (Opel P1), which doesn't reveal its special secret at the first glance. This model is yet again proof of André's love for upper class 'Made in Germany' automobiles apart from the mainstream, complete with panorama windows and fins. The Kapitän P1 is from a time when new cars were essentially construction kits sent from Detroit. A Chevy could have looked the same. On the German market the 1958 Kapitän was not very well received and was soon replaced again in 1959. The latter one has been made by Wiking. For American standards the Kapitän is quite slenderly equipped: a 2.5 liters 6 cylinder engine and 80 hp had to suffice. Still, the German General Motors flagship could reach a top speed of 142 kph (88 mph). By the way: the origin of the slightly frivolous sounding nickname can be found in the unusually designed taillights. 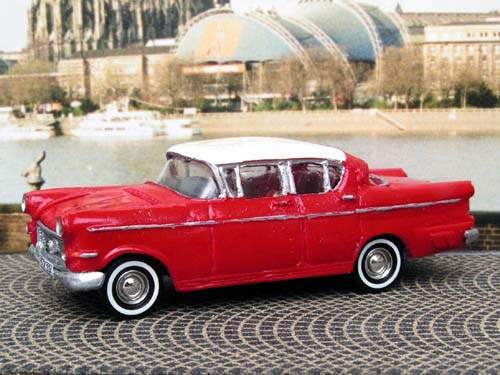 The P1 model by André Paul is the first resin kit in 1/87th scale with hood and trunk lid that open. The weird amassment of tiny pieces turns out to be a miniaturized 6 cylinder engine, which poses a challenge even to the advanced modeller. 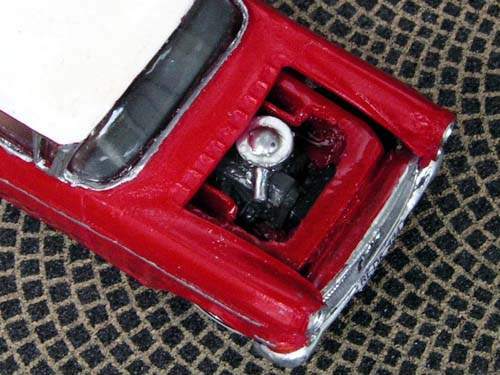 So far, a comparable construction can only be found in High Tech Modell's Alfa GTA. Alternatively the modeller can also build the model with closed lids, or let André do the work. Apart from those innovations, the model convinces with a design that very closely follows that of the prototype and is not as stylized as the Borgward's. All in all it appears to sit a bit too high on the wheels, though. The seats and dash board, the latter with a heavy indentation, are attached to the chassis. The instrument panel is printed on paper, imitating Brekina's 'TDI' decoration. The steering wheel is a very fine piece of resin with a separate horn ring. Unfortunately it is so thin that reworking it unavoidably results in breaking it. Delicate details and very thin walls (for resin) are general characteristics of the model. One can see that André liked taking that risk. Ducts for the axles are integrated into the chassis. The wheels themselves are reasonably well made. Only the holes for the axles still need to be drilled. 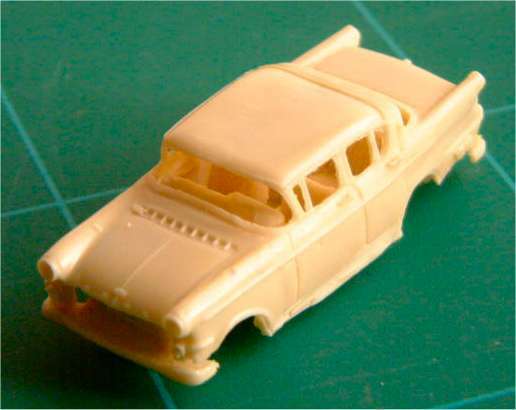 The pictured model is equipped with Busch whitewall wheels because of time constraints. There is a multi-part glazing which fits very well, but requires a lot of concentration to glue in properly. The separate air filter with its induction pipe is a prominent feature of the miniature engine. The radiator is a part of the chassis while the fan is a single piece. In my opinion the positioning of the engine is a bit off, in that most of it is obscured by the bulky front arm. The opening hood works by pragmatic mechanics. It locks in the desired position after a careful finishing. Cutting out the hood is troublefree because of the predetermined breaking lines, and there even is an extra piece for precautious modellers who would rather leave a safety margin and file off the rest of the hood when sawing it out of the body. Large and irregular gaps between body parts were common in the 1950s anyway. 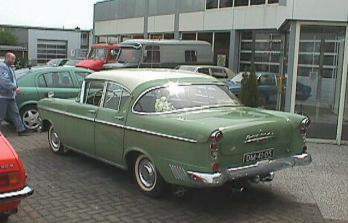 At the moment only the Kapitän P1 sedan is available, but ambulance and hearse are already being prepared - as is a police car and the one-off Authenrieth coupé. The 'Keyhole'-Kapitän is once again a model by André Paul that clearly bears his typical style. 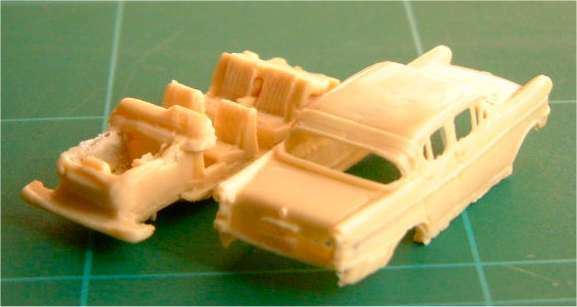 It is modelled after an exotic German prototype which is not going to be reproduced by a mass producer any time soon and it consists of many parts, even including a 1/87th suitcase. You will of course have to invest some time and effort to obtain a clean looking model in the end. The kit is moderately priced, taking into account the Borgward's prior success in online auctions. 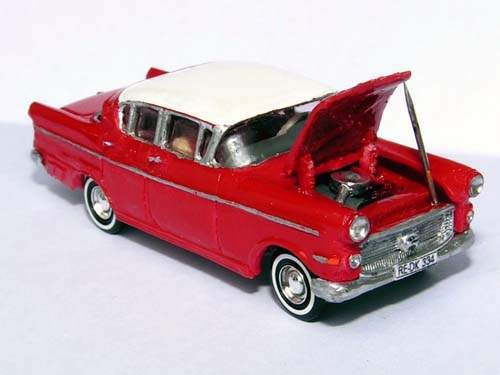 For the numerous Opel fans this model is a must-have anyway. I am looking forward to André's next release!